Eating healthy can get expensive. So what if you’re on a tight budget – does that mean you can’t feel good about the food you’re putting into your body? Absolutely not! As a previous college student and current blogger I know what it’s like to struggle to afford the healthy foods that your body needs. 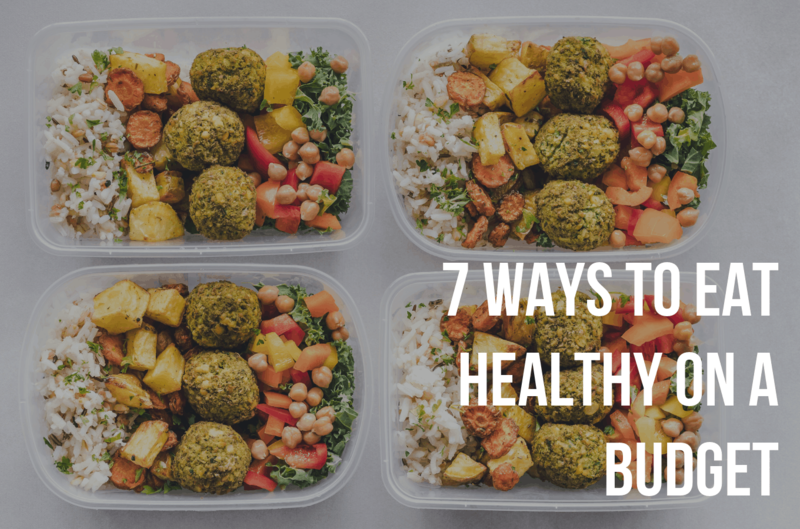 So without further ado, here’s my top 7 ways to eat healthy on a low budget! Tested and approved by yours truly. Buying fresh produce that is in season or from your local region is one of the best ways to eat healthy on a low budget. Fruits and veggies are in a surplus during their seasons because all of the farmers are selling their harvests at the same time. Economics 101 means that this increased supply results in lower prices for you – the consumer! Local produce can also offer significant savings. Local produce is in season and has a much shorter distance to travel before it reaches you. This saves producers and retailers on shipping costs and these savings are passed along to you! It also means that local fruits and veggies are the freshest and the nutrients in them have had less time to degrade. Plus there’s just something that feels right about warm pumpkin soup in autumn or a refreshing slice of watermelon on a hot summer day. Buy your fresh produce in bulk while it is in season and freeze what you don’t use! That way you can use any fruits or veggies you want year round but at a much cheaper cost. If you’re on a budget then you need to stop eating out, including snacks, and start making your own food. This tip seems obvious but it is one of the most important if you want to save money while eating healthy. Eating out is on average 5-7x more expensive than making your own meals and you have much less control over what you are putting into your body. I recommend that you start keeping a recipe folder for any meals that you’ve tried and enjoyed. Once you have a good list of recipes you can make at home it is a lot easier to resist the temptation of eating out. Check out my recipes section if you want some quick, easy, and healthy recipes. Pinterest is another great place to look for meal ideas and inspiration. You can also make your meals in large portions and save the leftovers for lunch the next day. I catch myself eating out during lunch because I get busy and don’t have time to cook. Having leftovers for a quick and easy lunch when you get busy can really help cut down on costs. Grow your own! Tomatoes, potatoes, onions, and beets are just a few beginner veggies that are really easy to grow yourself! Don’t have room for a garden or live in a colder climate? You can still grow fresh herbs like basil, mint, and parsley indoors with minimal setup! Building off of the last tip, meal prepping is another great way to save money while eating healthy. It is perfect for people with busy schedules because you won’t be tempted to go out for a quick meal (expensive and usually unhealthy) since your meals are already prepared. There are plenty of different ways to meal prep but I prefer getting all of my lunches prepared for the week on Sundays. I typically cut and prep all of the fruit and veggies I need for the week and cook any grains like quinoa that I will be adding to my meals. Some of my favorite meal prep lunches include buddha bowls, bento boxes, tacos, and stir-fry. Here’s a good list of healthy meal prep recipes and ideas to get you started! Smoothies are the perfect meal prep breakfast if you have busy mornings! Just cut up any fruit you need, measure out your other ingredients like kale or chia seeds, combine everything in a bag, and freeze overnight. Then you just need to add liquid and blend in the morning! I buy almost all of my non-perishable or dry food goods online. Shopping online allows you to quickly compare prices to make sure you’re getting the best deals. When it comes to buying groceries online there is a few options, but my favorites are Thrive Market and Amazon. You’ve definitely heard of Amazon, and they have some pretty good deals, but I’ve found Thrivemarket.com to have the cheapest prices. You can find out more on Thrive Market and how much you can save here: but generally I’m saving 30% on my grocery bills just by shopping at Thrive Market. It does come with a $60 annual fee but I was able to pay this off in savings after just two orders. In comparison, I’ve found that shopping on Amazon can save around 10-15% on groceries if you have a $99 prime subscription. While the savings are not quite as good, they definitely still add up. Ultimately, whether Thrive Market or Amazon is best for you will depend on how you shop. I go over all the details on this in my review of Thrive Market. Plan on doing 1-2 larger orders per month to save on shipping costs. Start adding healthy grains and legumes to your meals. They’re very nutritious, full of fiber and protein, but most importantly, they are ridiculously cheap. As an added bonus, they will also help you to feel full faster. They can be added as either a side dish or incorporated directly into the meal to help stretch your expensive ingredients further. Grains and legumes are the perfect item for meal prepping. Cook what you need for the week and just add it to your meals when you are ready to eat! Most stores offer store name equivalents of almost every brand name product. It’s no secret that these generic brands are significantly cheaper, but most people associate the lower price with lower quality. This usually isn’t the case. All manufacturers have certain quality standards that they have to follow regardless of the brand. Check the ingredient lists and you’ll find that generic brand products are almost identical to their brand name counterparts. This is especially true for healthy food products. These products tend to have fewer and more natural ingredients to begin with, which makes it easier for store name brands to replicate them. This tip can be combined with tip #4 for the ultimate savings. Thrive Market offers their own generic brand with a decent selection of health food products that I’ve found to be very high quality at a great price. Meat products are often the most expensive ingredient in a meal. You could go for cheaper meats like ground beef over steak or chicken thighs over breasts to save some money, but going vegetarian is where you’ll find the best savings. A common myth is that vegetarians or vegans can’t get enough protein without meat or supplements but that simply isn’t the case. Start slowly. Even replacing 1 or 2 days each week with a vegetarian diet can help you save money and is easily doable. From here you can find the balance between eating meat and saving money that is a good fit for your lifestyle.